Looking for more? Read more posts about Inspirational Quotes. « CVS: Huggies Diapers for as low as $1.66 per package! I have learned this one the hard way over the years. 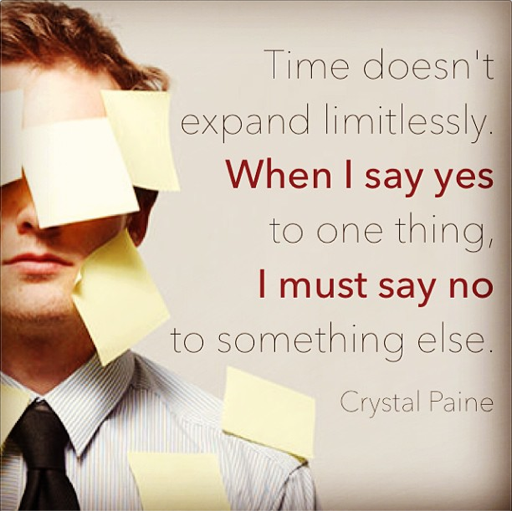 Now before I say yes to something big I try (still not perfect) to sit down with my time block calendar and see what I could give up to make time to start something new. I also pray and ask God to show me where I am wasting time on the unimportant and help me to then spend it on the important. WOW!!! I really needed to read that and plan to read your new book!!! I just found this out the hard way and am going to have to get out of something that I agreed to without thinking it through or looking at my schedule. I am going to commit your quote to memory or at least write it down and refer back to it. Thanks once again for helping me. So true. Excited about your new book! Sounds like it will be chock full of great advice. Congrats on your new book! I asked for your first for Christmas in 2012 (which I loved), and will have to ask for this one, too! excited to read this!! January is too far away!!! Looking forward to reading this, Crystal. We realized recently we were in a sort of survival mode and we’ve been taking steps to simplify. So true! As I get older, I say no more and more to time wasters, so I can do the things I love and be with the people I love. I lost my youngest daughter 4 years ago, (to murder, she was 19) and the aftermath and grief has taught me to live in the moment, and appreciate all that is around me. I tell people I love them on a daily basis. Thanks for your great site, looking forward to your book. God and goddess blessings, light and love. Crystal – this quote was such a BLESSING for me to read yesterday! I shared it with a co-worker today as well. Thanks for all the helpful information you share! My husband says you don’t get a bigger pie–all the pieces just get smaller when you add another thing to your life.